The Milwaukee Bucks landed a big man who can shoot in free agency on Friday, agreeing to a 3-year, $30 million deal with Mirza Teletovic. Teletovic averaged 12.2 points and 3.8 rebounds in a reserve role with the Phoenix Suns last season, shooting a career best 39.3% from three-point range. Teletovic is re-united with head coach Jason Kidd after playing for Kidd in Brooklyn. Teletovic played for the Nets during his first three NBA seasons. Multiple reports also say the Bucks have signed Cleveland free agent guard Matthew Dellavedova to an offer sheet, one that the Cavaliers will have until July 10th to match. The Milwaukee Journal Sentinel reports that it’s unlikely the Cavaliers will match that offer. The Bucks also lost guard Jerryd Bayless after he agreed to a three-year, $27 million deal with the Philadelphia 76ers. Bayless ranked fourth in the league in three-point shooting last season, averaging 43.7% from distance. Three-point shooting has become a must for NBA teams and the Milwaukee Bucks fell well short in that department this season. General Manager John Hammond and coach Jason Kidd both say job-one will be to bring in shooters during the draft and free agency. Kidd said he was hoping to have as many as four outside threats this past year, but O-J Mayo, Jerryd Bayless and Greivis Vasquez were hurt for much of the season as Khris Middleton was forced to take on a larger role. As a result, the Bucks made 440 three-pointers for the season. To put that number into perspective, Stephen Curry of the Golden State Warriors made 402 three-pointers all by himself. The Bucks were also hoping veteran Steve Novak would help, but the former Marquette Golden Eagle and Brown Deer native only played three games before his season ended with a knee injury. The Milwaukee Bucks led most of the way last night, but Andrew Drummond’s tip-in with two-seconds left gave the Detroit Pistons a 92-91 victory at the Palace of Auburn Hills. Bucks guard Jerryd Bayless missed a pair of free throws with 9.6 seconds left and the Bucks up 91-90. Kentavious Caldwell-Pope missed a three-pointer, but Drummond tipped in the miss. Detroit (37-34) entered the game tied with Chicago for the eighth and final playoff spot and a half-game behind Indiana for the seventh spot in the East. 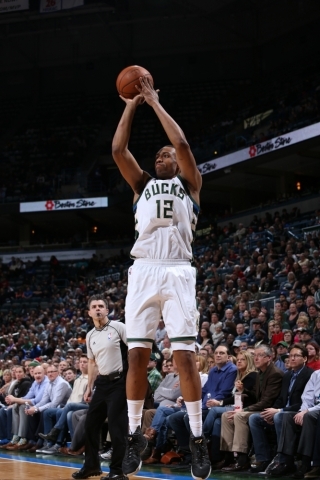 Khris Middleton scored a game-high 27 points and Giannis Antetokounmpo had 21 points and 12 rebounds. Greg Monroe had 18 points and 10 rebounds for the Bucks. Marcus Morris scored 21 points to lead Detroit. The Bucks coughed up leads of 17 and 13 points during the loss. They have 11-games left in the NBA regular season. 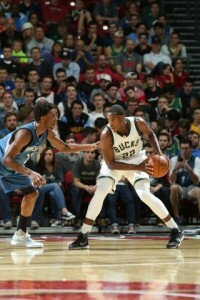 Jabari Parker – Photo Courtesy of the Milwaukee Bucks. The young Milwaukee Bucks have struggled with consistency this season. When things have been good, they’ve been really good. But maintaining consistency has been a struggle. Last night was one of those special nights for the Bucks. Jabari Parker poured in a career high 36-points, Khris Middleton added 30-points and Giannis Antetokounmpo added his second triple-double in four games with 18 points, 17 rebounds and eleven assists, helping the Bucks beat the Houston Rockets 128-121 at the BMO Harris Bradley Center. Middleton’s 30-point night included a 15-for-15 performance at the free throw line. Jerryd Bayless came off the bench and added 18 points, going five-for-eight from three-point range. Dwight Howard had 30 points and 13 rebounds and James Harden added 26 points for Houston (29-31). The Bucks build a 125-112 lead with 2:27 left to play. Houston went on a 9-to-nothing run to cut the Bucks lead to four before they found the answer and finished strong. The Bucks return to action Wednesday night when they host the Indiana Pacers in game three of their five game home stand. The Milwaukee Bucks held Miami to a season-low 36.5% shooting from the field and beat the Heat 91-79 in Miami on Tuesday night. Because of injuries, the Heat was down to its third point guard and second-year pro Tyler Johnson struggled against the constant pressure of Bucks point guard Michael Carter-Williams. The schedule makers haven’t been kind to the Heat. They returned home from a six-game road trip for the one game against the Bucks. Now they head out on a five-game road trip. The Milwaukee Bucks rallied from 14-points down to tie the game at 89-all, but the Dallas Mavericks rebounded to pull out a 103-93 win at American Airlines Center on Monday night. Former Marquette standout Wesley Matthews answered the Bucks run with a pair of three pointers to give Dallas a 95-91 lead, a lead they would not relinquish. Matthews led the Mavericks (18-13) with 22 points and former Buck Zaza Pachulia had 17 points and eight rebounds to lead Dallas. Dirk Nowitzki was just 3 of 15 from the field and scored a season-low seven points. 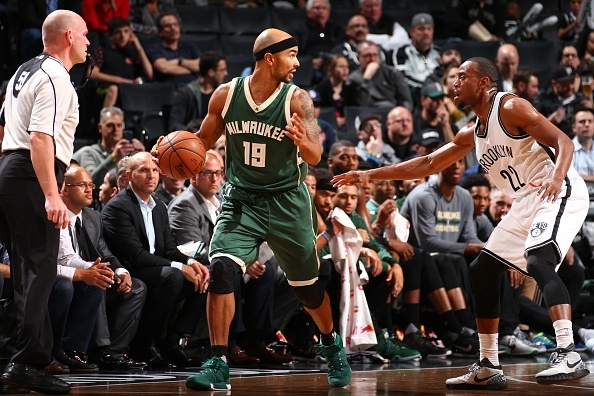 Jerryd Bayless returned to the Bucks lineup after missing eleven games with an ankle injury. He came off the bench and led the Bucks with 19 points. Khris Middleton, who was ejected in the final seconds, added 15 points for the Bucks (12-20) who dropped to three-and-14 on the road this season. The Bucks have a quick turn-around, facing the Thunder in Oklahoma City tonight. With coach Jason Kidd serving his one game suspension handed down by the NBA on Friday, his Milwaukee Bucks fell to the Orlando Magic 114-90 in Orlando. Up 49-43 at halftime, the Magic came out in the third quarter and shot 81% from the floor, hitting all six of its three pointers and putting 37 points on the scoreboard. The Magic went on to shoot 52% from the field for the game. Milwaukee (6-10) lost for the fifth time in their last six games. They got 17 points each from Giannis Antetokounmpo and Jerryd Bayless. Khris Middleton added 15. Bucks point guard Michael Carter-Williams committed five turnovers and scored just three points in 24 minutes. Center Greg Monroe also struggled, hitting just 3 of 12 from the field and scored nine points in 19 minutes. The Bucks practice today and play at Charlotte on Sunday afternoon. The Milwaukee Bucks, who lost by 37 points at Indiana on Saturday, put an end to their three-game losing streak, upending the Detroit Pistons 109-88 at the BMO Harris Bradley Center on Monday night. Greg Monroe scored 20 points and pulled down 13 rebounds for the Bucks. He also held Pistons center Andre Drummond scoreless in the third quarter as the Bucks were up 88-62 entering the fourth quarter. Drummond had 15 points and 14 rebounds at halftime. He finished with 15 points and 15 rebounds. A total of seven players scored in double figures for the Bucks (6-8). Giannis Antetokounmpo added 17 points, Khris Middleton had 16, Jerryd Bayless 14, Jabari Parker and Michael Carter Williams with 12 each and Greivis Vasquez finished with ten. Defensively, the Bucks held Detroit to 34% shooting from the field and 6 of 28 from three-point range. The Bucks return to action on Wednesday night against Sacramento at the Bradley Center.